1x Champ, Throws beautiful heads, dam's color! Belagio's Goliath is a big guy in our breeding program! We purchased him as an adult who was not shown as his full brother was campaigned successfully in the show ring. We could not pass him up when we saw his gorgeous typey macho head and correct conformation. 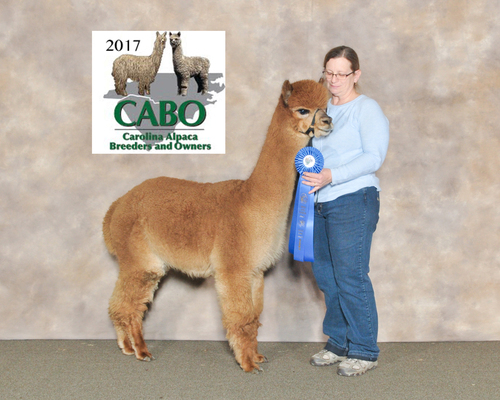 You can imagine our excitement when Goliath received the Fawn male Color Championship as a four-year-old. He has excellent bone. A plus is his personality that just makes you smile thinking about him. Isabella is everything a foundation female should be with excellent bone structure and conformation. 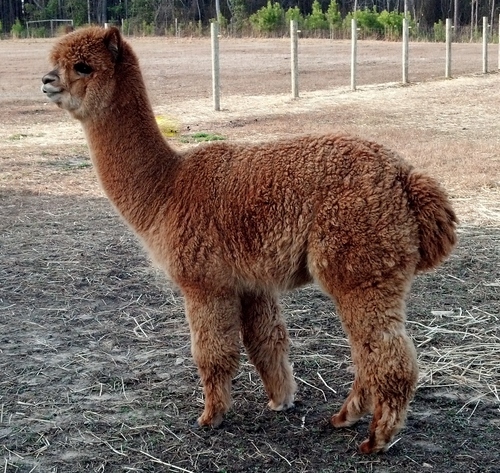 Her fleece has excellent density, crimp and fineness. Isabella has proven to be an excellent mother. She is easy to do herd health on yet she prefers to be off with her group of female friends. Her sire, Charles P Atlas, has produced some very nice show animals and Isabella is no exception. She has the bloodlines of Quetzel, Timoteo, Matador and 6PAtocha's Gold. Isabella's appeal is the ability to breed her to light or dark males due to her white, fawn, and black ancestry. She is a really, really super foundation female. 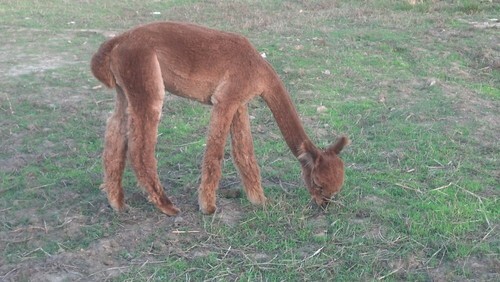 She tends to bring out the best of the sires' characteristics and her cria have the nicest personalities and are calm and personable. Belgiola's name incorporates the names of both his dam, Isabella, and sire, Bellagio's Goliath. He is living up to his genetic inheritance, exhibiting soft, crimpy and dense fiber. As you can see, is continues the winning tradition of his dam and sire. 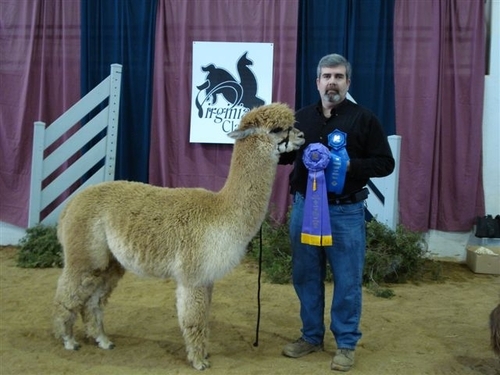 At the 2017 Carolina Alpaca Celebration where he won blue, the judges prized his solid stature, compactness, and density, fineness and consistency of fleece at 5 years old. As you know, the fawns are highly competitive. He clearly is holding those all important characteristics for which he won his ribbons. 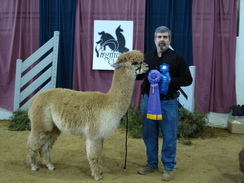 Belgiola's sire is the Color Champion Fawn Male (Virginia Classic), Bellagio's Goliath, owned by Carolina Pride Alpacas. BB as he is know here, has the genetics of Fantasma and SA Accoyo Royal Avenger having a bold crimp style, fineness, density, and solid stature. Bellagio is a quality macho and his son, Belgiola is gentle and endearing and shows off his stunning ancestral characteristics, just take a look at his coloring and solid conformation. Lets not sell the rest of his lineage short, either--PPPeruvian Royal Fawn 6014, PPPeruvian Augusto 6009, PPPeruvian Timeoto, PPeruvian Cornus, Charles P. Atlas, 4Peruvian Matador 6030, 5Peruvian Chabacana 8678 are all in his bloodline. This guy has color there also--LF, MF, BG, WH, TB. 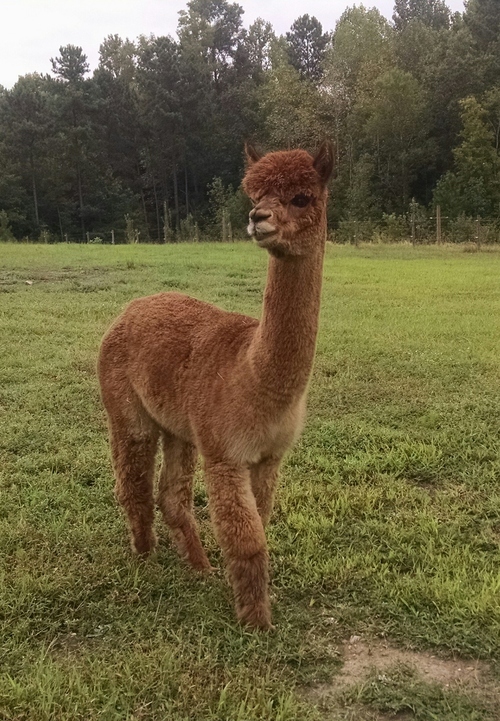 Belgiola truly meets our farm's breeding and fiber goals; he is registered as a dark fawn but you have to see the maroon coloring in his fleece, it is just gorgeous. Belgiola has begun his breeding duties and he has thrown females and fawn! Belgolia is my favorite on the farm. I do encourage you to consider adding his genetics to yours. Proven winners and strong foundation animals are his heritage, which he continues to pass along. Call me and let's arrange a visit.